Brent C Bruun, Chief Operating Officer, KVH Industries Inc.
Brent C. Bruun, Chief Operating Officer of mobile broadband for KVH Industries, joined KVH in 2008 and has been instrumental in setting the strategy for KVH’s mini-VSAT Broadband service, which is now the industry’s leading maritime VSAT provider. 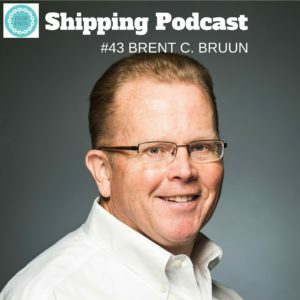 Brent Bruun is dedicated to creating solutions to meet the maritime industry’s need for improved operations through connectivity. Before joining KVH, Brent held positions with satellite operator SES AMERICOM, KPMG LLP, and General Electric. We discuss the fact that usage of mobile broadband at see is going up, on a monthly basis, that new sattelites are going up and that ew sattelite constellations is formed, which will be able to support the increased use. Brent sees the future going with the internet of things and the connection between ship and shore becoming vital. Join the conversation, is the maritime industry ready to embrace digitalisation? You are welcome to comment here on the website on, Twitter using the handle @ShippingPodcast or on the Facebook page. Tell your friends to do the same, this is an urgent discussion!